Paul and Jenny Polhemus, along with their daughters, Natalie and Grace, are “HOOKED ON POKE”. While down in So Cal watching their daughter play beach volleyball at the Junior Nationals, eating Poke was a must. The fresh, healthy choice was perfect for athletes and families alike. They decided that having this in Lodi would be fabulous. Both of them were born and raised in Lodi. Paul owns a local septic construction company in Lodi and has been in business for over 20 years. Both daughters attend Tokay High School. After returning from the beach volleyball event, they signed a lease to the Lodi Ave. location. They are overwhelmed with excitement of having something fast, fresh, and healthy in Lodi. With Poke, you can always feel great about what you are eating! Once the lease was signed, it was onto a name. Jenny’s sister, who’s Roller Derby moniker was “Loco Lisa”, passed away 7 years ago. 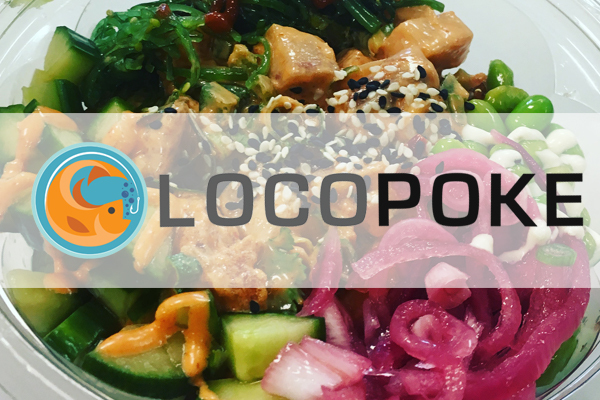 The name, “LOCO POKE” , deemed perfect in every way. With a passionate work team and the freshest ingredients, they can’t wait for you to get hooked also. Paul and Jenny Polhemus, along with their daughters, Natalie and Grace, are “HOOKED ON POKE”. While down in So Cal watching their daughter play beach volleyball at the Junior Nationals, eating Poke was a must. The fresh, healthy choice was perfect for athletes and families alike. They decided that having this in Lodi would be fabulous.